Danny Hannan, long serving CAMWEST member, wonders what life will be like in a few years time, in a future with a lot less oil than now, after Peak Oil. Come ride with us! Our rides are easy and friendly. Description of ride: A gentle ride around the historical sites of Parramatta on quiet streets with commentary. Sydney's big one! Here's your chance to ride along a whole lane of the Sydney Harbour Bridge, from North Sydney to Parramatta Park. More info. 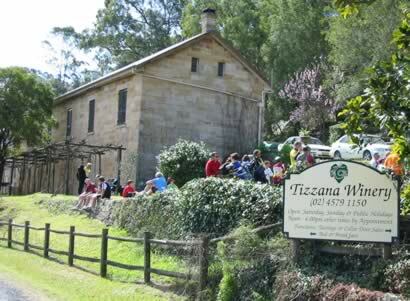 Our most popular ride was held Sunday 22 August, 2004. Although we had fewer numbers than usual, a great time was had by all, with riders choosing from a selection of three ride lengths. Two riders did the long (90 km) circuit, and a few more than normal (5 or 6?) did the short ride. The rest tackled the medium (70 km) route. The sweep vehicle was used to pick up one rider who had just about run out of steam near the top of the hill on West Portland Rd, and, after a quick energy fix and a few km in the car, dropped her off at the end of River Rd to enjoy the downhill run to the Sackville ferry with the rest of us stragglers. The lunch at the winery was a bit more relaxed with the smaller numbers. After lunch 5 of us detoured down to Ebenezer Church, and made our way back to Wilberforce via Swallow Rock Reach Walking Track and a few backroads. It was a great day for cycling, but there did seem to be a headwind (or at least a cross-wind with some headwind component) wherever we were heading. Thanks again to Michael (and his 'pillion' passenger, Greg) for doing the sweep. Six riders braved the drizzly conditions to ride from Blacktown to The Goumet Food Markets in Castle Hill on July 10th. The markets were quieter than normal, probably owing to the overcast and drizzle, but still worth going to. A fun adventure was had by all when a rider had a puncture and the spare tube she was carrying wouldn't fit in the rim because of the type of valve. CAMWEST hosted a bicycle advocacy workshop for BUGs on Saturday 7th August, 9am -12.30pm, at Parramatta Heritage Centre, which was followed by lunch and a ride around Parramatta. The workshop included CAMWEST Media Officer Marty Olmos on how to design eye catching cycling promotion information and Chris Reeves from Hornsby Council on how cycling facilities can be included in section 94 plans. Shared path starting at Coleman St, Merrylands, on the southern side of the M4 and heading east, then alongside Rita St, Under the M4, then along Rees St to Banks St. (At least part of this was originally a narrower footpath). No cycleway along Banks St, but it starts again at Pitt St, heading in to Parramatta. Or, by crossing over Pitt St, there is a path through Ollie Webb Reserve. Shared path along Adderley St West, Auburn. The path from Mirambeena Pk (Lansdowne) through Carramar and along Prospect & Orphan School Cks to Canley Vale has been completed. The path from Blacktown to Prospect has been started — The path route can be seen from the earthworks on the west side of the Prospect Hwy from Harrod St heading North. “This project extends the 'catchment' areas of public transport networks by offering facilities for those who find it too far to walk to their local station but who are happy to cycle. “One-third of car trips taken by Australians are less than three kilometres long and many trips could be taken on a bicycle if people were confident that their bike wouldn't be tampered with or stolen while they are at work. We have been disappointed not to see more 'Roads to Recovery' funding from the Federal Government used by councils to improve cycleways. 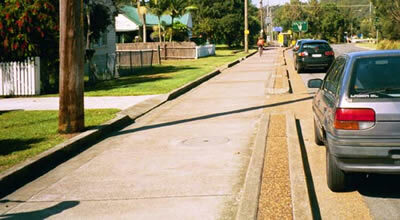 We understand that in WA, the City of Gosnells committed the whole of their funds,$2.3 million, to off road cycleways. In the case of Hawkesbury council, it received $2.9 million to 2005. CAMWEST requested 5% which equates to $145,000 for cycleways, but this was rejected. CAMWEST has been in correspondence with Fairfield City Council about a number of concerns on the cycleway along Orphan School Creek. It seems a number of good things are happening. Fairfield Council agree in principle the path is inadequate and are wrestling with the conflicting issues of constructing new cycleways or diverting funding to fix up this old one. In the coming years Council will apply for funding to increase the width of the narrow parts of this route. It still remains a good ridable path with continuous off road cycleway from Georges Hall (Mirrumbeena) to Abbotsbury (Fairfield City Farm). You take your life in your hands when you navigate a roundabout, laments Peter Say, who reckons a rethink is the right road to take. ALAN KOHLER: Do you think that if more super-giant oil fields are not discovered soon and Saudi Arabia, in particular, invests that the world will have to get used to higher oil prices, around the $50 level, possibly even more? ANTOINE HALFF: Well, we're not there yet, but there's a widespread sense in the market that fundamentals have shifted, and we're now in an era of higher oil prices for the sustainable future. I think there's probably a lot to say for that theory. How will we travel in 2024? The cost of car crashes in this country alone amounts to $17 billion. It is estimated that the humble traffic jam costs America US$100 billion. And then there's the cost of wars to keep the oil flowing. How much longer can we afford to continue along these lines in future? Why roll anything up to 7.6 tons of metal (the Hummer H1) onto the road, when a bicycle will do just as well? Well, it’s partly because people are terrified of being mown down by 7.6 tonnes of metal. With the Federal elections upon us, now is a great time to write to your MP and ask him/her to provide federal funds to improve cycle infrastructure. Cycling could make a positve impact on a number of issues of national signifcance, including health (childhood obesity just to mention one), pollution, greenhouse emissions, not to mention reducing our dependence on expensive imported oil.See our letter writing page.